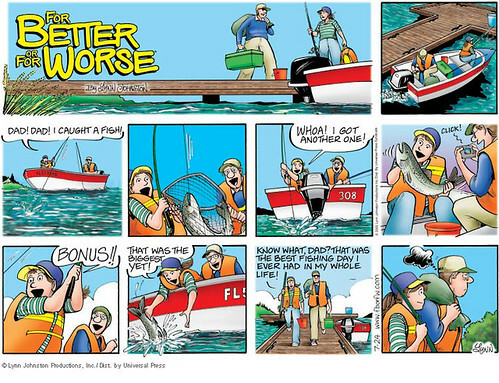 I've received a few emails regarding this comic strip and my plea for help. There seems to be two trains of thought on this one. The first theory is that John is upset because April mentioned she had the best fishing day when he felt it was more of a father/daughter day. As happy as April was when she stated "Know what, dad? That was the best fishing day I ever had in my whole life! ", John found a fault in her statement, displeased that she celebrated the fish more than her love for him. This is probably what Lynn Johnston was going for, but it seems awfully harsh of John and rather out of character. April is young and is happily remarking on the great day she had. This should make John smile, not scowl! Another theory is that John is selfishly upset that he didn't catch any fish and April caught many. There's no way the John I know would be upset at this fact. As you'll see in the strip, complete with my annotations, John was extremely happy in every previous frame, helping with the net and taking pictures. What father wouldn't be happy watching their child succeed in this manner? Again, John should be happy. I'm still interested in hearing your theories as to what this strip is about. I still don't quite get it.